While redesigning my navigation system, I realized that I wanted several instruments to share information with my chartplotter, while also being able to share information between themselves. In addition, I also wanted a PC to be able to receive information from these instruments. 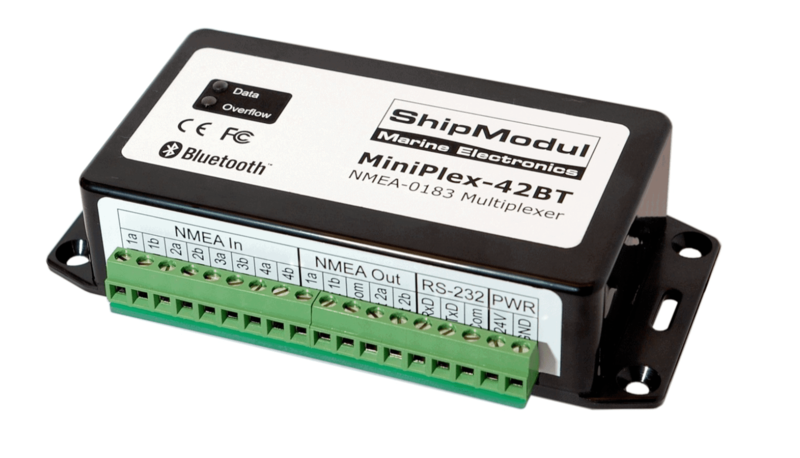 After some investigation, I found a whole product line of NMEA multiplexers from Shipmodul. I chose the MiniPlex-42BT. This version allows for 4 “talkers”, compatibility for SeaTalk and AIS, several “listeners” depending on your configuration, and Bluetooth support for your computer. My goal was to connect my Tacktick NMEA interface, autopilot, chartplotter, AIS receiver, VHF radio, and my PC all to the same system. After a lot of trial and error, and using MPXConfig from Shipmodul which allowed me to see the exact traffic passing through my multiplexer, I ended up with a slightly modified configuration. Most notably, I was unable to connect my AIS receiver to the multiplexer – not because it wouldn’t work, but because it sent so much data out so fast, that it caused “overflows” – where data from the slower NMEA 0183 instruments was being dropped in favor of the AIS data. Although AIS is nice information, I would rather have my chartplotter talking to my autopilot than know what’s around me. Final configuration was to have the chartplotter, VHF radio, and Tacktick NMEA interface all connected as “talkers” so that other instruments could see their data. The chartplotter, VHF radio, Tacktick NMEA, and autopilot were also “listeners” chained off of one port of the multiplexer. The AIS system was directly connected to my chartplotter over a NMEA 0183 high speed port. My PC used Bluetooth to see all of this data, and also transmit waypoints and routes if needed. The only disadvantage to this system is the fact that the AIS data is not visible on my PC, which is running Rose Point Navigation’s Coastal Explorer software, which supports AIS. I don’t use my PC while underway, but it would be nice to see things at anchor or when planning a short trip. By far one of the most useful utilities when building this configuration was the MPXConfig utility available for download from Shipmodul. If you purchase one of the newer AIS/Bluetooth units, you will need to download a newer version of the utility from the link above, as the one included on the shipped CD does not allow you to toggle AIS. When setting the unit up, you have a number of options – Server, Hub, AIS, and Auto. I chose Hub mode because I wanted everything that came in all talker ports to be repeated out the listener ports. By default the system comes setup as Auto mode, which will toggle between these. One of the things I wanted to work all of the time was for the autopilot to receive wind angle data and waypoint information (if a course was set) regardless of what else was going on. Leaving the system in Auto or Server mode would have possibly caused some of the messages coming through to be dropped in the event that another instrument got chatty. Hence the reason for choosing Hub mode. However, when using Hub mode, you have to be careful. NMEA 0183 is limited to 4800 bits per second, which is pretty slow. With the Tacktick NMEA interface transmitting wind, compass, and fast heading information, along with the chartplotter and VHF. With the default configuration on my chartplotter, I ended up having a lot of overflows – where data is dropped from one talker because there’s too much going on. After examining Garmin’s configuration reference, and reading about NMEA sentences and which ones meant what, I chose to disable some of the Garmin proprietary sentences to slow down the amount of data going to the multiplexer. This ended up solving my overflow problem. Overall I have been very happy with the multiplexer. Being able to connect to it via Bluetooth is very convenient, and helpful for planning trips and reviewing data. Having all of the instruments connected together makes things so much easier to use. Now my wireless Tacktick instruments display waypoints, XTE and other useful information when a course is set, and the autopilot steers towards it correctly, all while the chartplotter is getting depth, speed, and sail angle information which it never had before.